This basket muzzle is recommended by Veterinarians, dog trainers and dog owners as a safe and secure training tool to reduce biting, barking, chewing and aggression of your dog. While wearing our basket muzzle your dog will be able to open his mouth to drink water and pant. 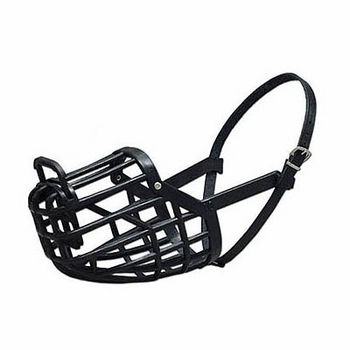 The flexible plastic basket muzzle has a adjustable leather strap and removable front grill. Removing the front grill from the muzzle will give the dog a little extra room at the end of the nose if needed. Our Italian basket dog muzzles are made in Italy. Dogs similar to breeds listed in the size chart for sizes 1, 2, 3 and 4. Circumference - measure at approximately 1/2 inch below the eyes go all the way around the snout. Length - measure your dog from the inside corner of one eye to the tip of their nose. Note: order the muzzle that is 1/2 to 3/4 of an inch bigger than the exact circumference of the dogs snout. Dogs similar to breeds listed in the size chart for sizes 5, 6 and 7. Circumference - measure at approximately 3/4 inch below the eyes go all the way around the snout. Note: order the muzzle that is 1 to 1-1/2 inches bigger than the exact circumference of the dogs snout. Dog similar to breeds listed in the size chart for sizes 8, 9 and 10. Circumference - measure at approximately 1 inch below the eyes go all the way around the snout. Note: order the muzzle that is 2 to 2-1/2 inches bigger than the exact circumference of the dogs snout. If you have a question about measuring your dog drop me a email at sales@morrco.com or call me and I will answer your questions. The baskets circumference must be larger than your dogs snout measurement. If your dogs snout is the exact same size as the dog muzzle, your dog will not be able to open his mouth to pant. The measurements in the size chart below are the length of the basket and the circumference of the basket. Not sure about how to measure for a basket dog muzzle? Give us a call at 1-800-575-1451 and we will help! The size 1 usually fits small Maltese, Papillon and similar size dogs. The size 2 usually fits large Maltese, Miniature Dachshund, Toy Poodle & Yorkshire Terrier and similar size dogs. The size 3 usually fits Bichon Frise, Standard Dachshund and similar size dogs. The size 4 usually fits Border Terrier, Jack Russell Terrier, Miniature Poodle, Miniature Schnauzer, Shetland Sheepdog and similar size dogs. The size 5 usually fits Basenji, Bedlington Terrier, Fox Terrier, Lakeland Terrier, Norwegian Buhund, Welsh Corgi, American Cocker Spaniel and similar size dogs. The size 6 usually fits Beagle, Bearded Collie, Border Collie, Brittany Spaniel, English Cocker Spaniel, Standard Poodle, Standard Schnauzer, Keeshond, Welsh Terrier and similar size dogs. The size 7 usually fits Dalmatian, Elkhound, Small German Shepherd, Pointers, Samoyed, Springer Spaniel, Soft-Coated Wheaten Terrier, Shar-Pei and similar size dogs. The size 8 usually fits Airedale, Bull Terrier, Chow Chow, English Setter, German Shepherd, Golden Retriever, Labrador Retriever, Irish Setter, Rhodesian Ridgback, Siberian Husky and similar size dogs. The size 9 usually fits Bassett Hound, Bernese Mountain Dog, Briard, Clumber Spaniel, Gordon Setter, Large German Shepherd, Old English Sheep Dog, Weimaraner, and similar size dogs. The size 10 usually fits Afghan Hound, Akita, Belgian Sheepdog, Borzoi. Giant Schnauzer, Great Dane, Large Hound, Irish Wolfhound Lurcher, Newfoundland and similar size dogs.